Stock up on summer reading with bargain books at read-iculously low prices from National Book Store Super Summer Sale! Bookworms and bibliophiles everywhere know that summer is high season for juicy fiction, gripping revelations, and other fascinating plots from books that you simply can’t put down. If you missed the Great Warehouse Sale last week, here’s another must not miss event from the Philippines’ premier bookstore. 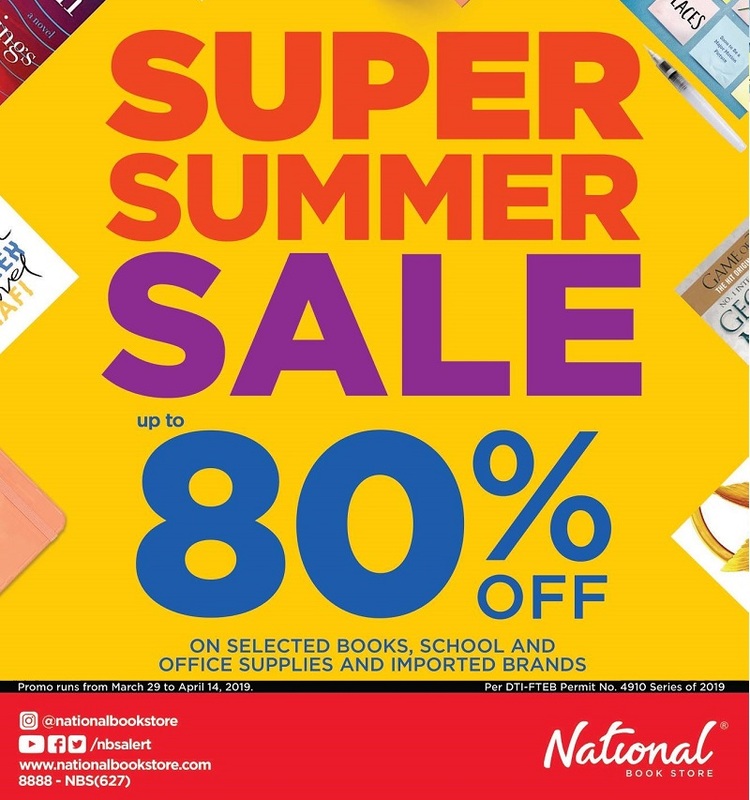 Unlike their previous warehouse sales, National Book Store Super Summer Sale is happening in all NBS branches nationwide until April 14, 2019. Spice up your sunny days and get up to 80% OFF on select books, imported brands, school and office supplies. After all, warmer temperatures and long, sunny days call for picking a new lineup of books to peruse wherever you are. Immerse yourself in a story that will add drama, romance, and adventure to any sleepy summer afternoon. Tag the whole squad and head to the nearest National Bookstore outlet. Let’s do some haulin’! Discounts will be given to cash, credit card and gift certificates purchases. E-Purse points can be used in purchasing discounted items but redeeming of points are not allowed. Courtesy card and other discount coupons not valid in this promo. In the purchase of good and services which are on promotional discount, the senior citizen can avail of the promotional discount or discount provided under the Expanded Senior Citizens Act 2019, whichever is higher.